Image: Vogue / 2013 Met Gala After Party, Punk Theme LOVED! 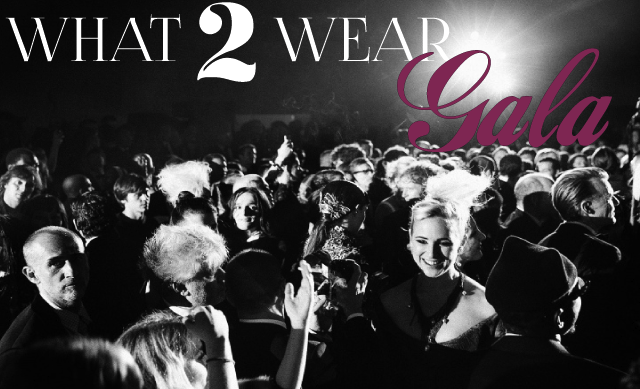 Today on WHAT2WEAR we are going to focus on how to dress for a gala. I chose this topic because I recently attended two back to back. Both supporting great causes and yet each called for two totally different looks. Do a little research by checking out what the vibe was like the previous year(s). This will give you insight on what the venue was like, the mood and who was attending (age, what they wore). Once you have determined the level of dressiness follow my guide below to help map it out! And of course I'm going to share with you my two looks for the events I attended, just keep reading. LOVE 4 A CURE is a non-profit organization focused on raising funds for various Canadian charities and this year they chose to support The Princess Margaret Cancer Foundation. The Princess Margaret is one of the largest comprehensive cancer treatment facilities in the world. It sees over 1,000 patients every day and has the capacity to deliver diagnostic, treatment and follow-up care to close to 200,000 patients and their families every year. This alone made me proud to be a part of such a wonderful event. So let's get to the style. The event did say black tie however after conducting my research I did notice the crowd overall was fairly young (late twenties to mid thirties) and for the most part people were dressed nice but not over the top black tie that I originally had in my head. With this window of opportunity I decided to forgo the dress and go with a midi skirt (super hot for spring FYI) and a crop top. This may sound casual but that's because I chose to have my accessories steal the look. Naturally I met up with Desiree, designer of Armed jewelry, to get hooked up for my event because I knew she would have exactly what I was looking for and as you can see below... she totally did! I really loved this outfit because I felt appropriate enough when it came to how dressy I looked and I felt comfortable by having my personal style show through by being a bit trendy. MOTIONBALL is a not-for-profit organization that builds awareness and raises funds for the Special Olympics Canada Foundation. Since it's inception in 2002, motionball has donated over $3.3 million to the SOCF!! It's another feel good party to attend and this is one in Toronto that you do not want to miss. With this being their 13th year hosting the event you can expect it gets bigger and better each year. This was my first year attending and it certainly won't be the last. I was blown away by how beautiful it was, how amazing the energy was and overall it was just a really great group of people. This gala was in fact a legit black tie event so there was no doubt in my mind that I was going with a gown. My day gig is working for a New York based bridesmaid dress line called Twobirds and I knew that was what I wanted to wear in black. I know you are thinking to yourself "but no one ever wears their bridesmaid dresses again" well we are different. We make dresses that you actually do wear again and this just proves it (or you can check out this other post for further convincing). The other part I was set on was having an accessory piece be a major element to my overall look. Feeling a little gutsy I chose to go with a headpiece that I literally became instantly obsessed with the second it was placed on my head. Unlike a necklace that becomes part of your outfit this kept my dress and the accessory separate so they could both receive equal attention. This piece was also crafted by the one and only Armed that's now available in her shop and soon at Bicyclette for those of you in the Queen West area. I'm so happy I was able to wear a look like this. Events where we can get as dolled up as we wish without feeling overdressed don't happen all the time so cease any opportunity you get! 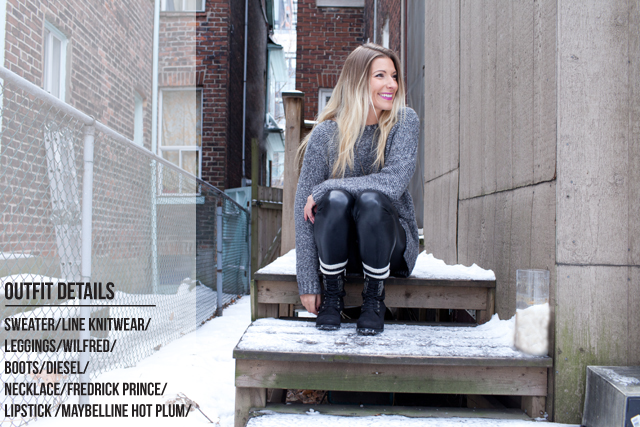 Today's look is featuring an awesome Canadian label called Line Knitwear. If you haven't heard of them yet DO check them out. I've seen Line scattered along Queen West and each time I see something by them it catches my eye and sure enough when I look at the label to see the brand it's always Line. In those type of cases it's time to purchase the product! All of their pieces are so cozy and beautiful at the same time. If I could live in this sweater I would - in fact I'm wearing it as I'm writing this. Every time I have worn this sweater I've been stopped by least one person asking me where it's from. It's definitely one of my top essentials this winter season!! Can you believe it took me over a year to wear these pants for the first time after purchasing them? I even remember taking them back to the store with intentions of returning them to only realize that I brought the wrong receipt when I got to the cash AND it was the final day to do the return. So I guess I didn't wear them for so long because I was holding a grudge on these pants for not leaving me! Ridiculous, yes but what other reason could it be seeing as how these pants are freaking amazing!!! 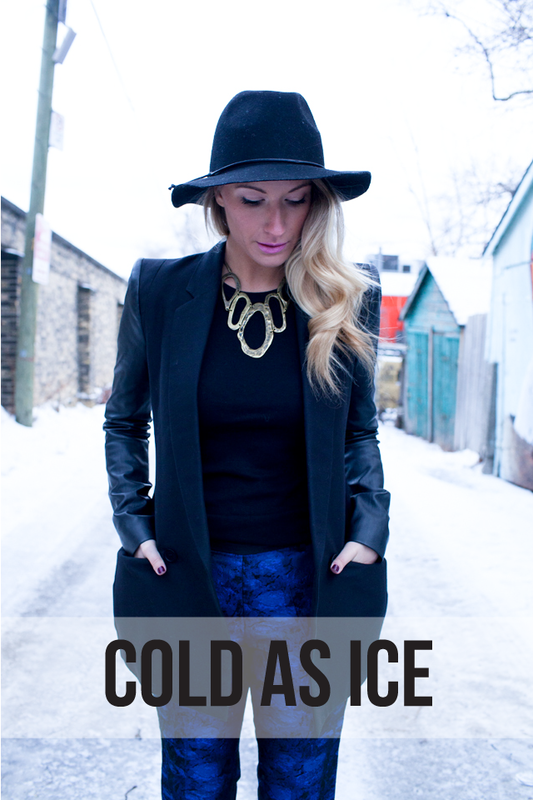 They pack a major punch especially with this all black outfit and cobalt blue is still super hot right now. So just remember... don't get mad at your clothes just embrace them and figure out a way to work with them! After all, something did draw you to them in the first place! Is everyone starting to feel the Valentine's Day love?? Everywhere I turn there are hearts and pink and LOVE just sprinkled like confetti and I have to admit it puts a smile on my face. I love love. I love to love, I love to be loved. I love love. Anaaaannd I have already used the word ten times in three lines oops! I know there are a lot of you out there who think it's a silly occasion and that's fine but I am one to feel the opposite. In my opinion a lot of people get caught up in the routine of life and neglect the little things that matter. Something that is important to me in a relationship is to never stop going on dates with each other. I mean that was such an exciting part in the beginning wasn't it? I will never get sick of getting dressed up to go out for a lovely dinner or maybe for you it's getting bundled up and going ice fishing together because that's what you both genuinely enjoy doing (so random I know but I live in Canada and we are currently getting dumped on with snow so just roll with it). Anyway since the majority of you reading this are women I think it's safe to say, whether you want to admit it or not, you hope for something special when February 14th rolls around. But this is a two way street señorita! Let's pull ourselves together, well you not me I'm VDay free, and make sure you are looking, smelling and tasting your best when that somethin' special comes your way. Since I don't have someone to treat this Valentine's Day I'm going to treat a lucky reader to a package full of love that will ensure that smile that I was talking about up top is taken care of. Getting dressed up and wearing that infectious smile is one thing but making sure your breath is fresh to death when that smooch comes your way is another. DenTek who makes the little floss picks that are included in this giveaway did a survey that concluded that 79% of you Canadian women would turn down a date with Brad Pitt if he had mega bad breath. Yep, just putting it out there that if you're not into it I'm pretty sure neither is he, but guess what - I got you guuuurl! Giveaway includes a super cute make-up pouch and compact mirror, sweets, breath strips and DenTek floss picks. 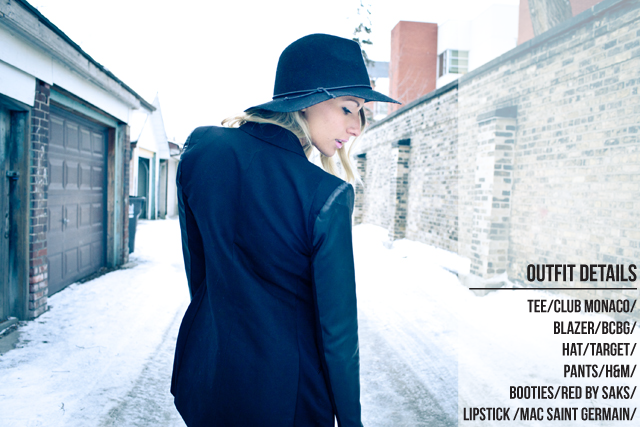 Visit Trend Struck's Facebook page on Monday February 10th to see if you are the lucky winner!! My favourite accessory of the moment has to be my metal belt. Mine in particular is the Carmella belt by Brave Leather, a Canadian company. They offer a variety when it comes to both the metal and the colour of the band. I want one of each eventually! 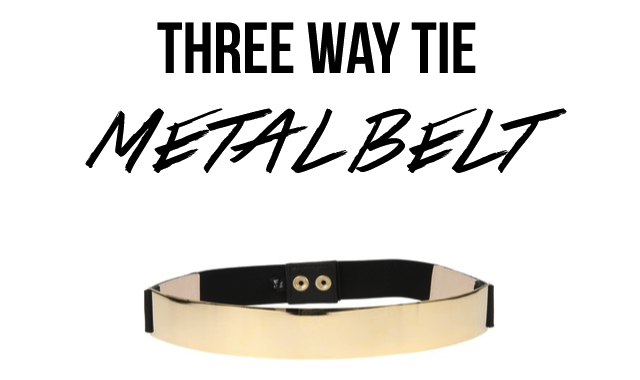 Since I wear my belt a lot I thought it would be perfect to feature for my 'Three Way Tie' segment this time around! Black on black. Opting for that all black outfit just got more interesting. Wearing the metal belt breaks up the black and makes a big statement. Yes I decided to go overboard with even more accessories in this look because that's just what I do, but wearing just the belt is all you need to richen up a simple outfit. Corporate event. This outfit was styled in the fall so by wearing layers I was able to use the belt to pull everything together. This outfit is more minimal with accessories as the overall look is much softer than the previous yet a punch in lip was the perfect complement to such a bold belt. Fancy outerwear. Now we are really thinking outside of the box! Why would you not try to get stylish with your outerwear since we are bundled up in it for half a year! Any jackets you own that can be belted I strongly urge you to get creative with belts you already have to see what you can come up with. Simple facelifts like this one can go a long way. Especially with jackets being pricey you will feel like it's brand new!